Want to know how crazy I am? That’s five day old bread you’re looking at. Completely untested and untasted until it was judged honey raisin bread. I was hastily working on a brand new breakfast bread recipe last Wednesday. I was so busy I didn’t even take the time to make the loaf pretty or bother covering the top at the end of baking. This bread never intended to be photographed and especially wasn’t supposed to go to the fair. This was a test loaf. Something I’d never take pictures of, or give to you until I know it worked. However, I realized the fair entries were due that day and I didn’t have a spare moment to throw something else together. So off it went to the fair of course! For all I knew it could have had holes all over inside and been completely inedible. I dropped off this lopsided overly-browned bread and forgot about it. My family ate cold cereal the next day for breakfast. I'm such a good mom. The next busy crazy afternoon, my friend Julie calls me on my way to an out of town meeting and tells me my bread has two ribbons on it. She already knew the story and we both had a good laugh. I still have no idea what those ribbons mean, but the bread has now been tested. It’s really quite good surprisingly! This bread utilizes the dough cycle on the bread machine to cut down the work, but the final rise and bake is done the old fashioned way. 1. Place all the ingredients in a bread machine with flour on top, and yeast on top of the flour. Select the dough cycle on the bread machine and hit start. 2. Once the cycle is finished, remove the dough from the pan onto a clean and floured surface. Knead the dough several times until lightly sticky (but not too sticky), adding a little more flour as needed. 5. Bake the loaf for 32 to 35 minutes or until deeply golden on top. Cover the last 10 minutes with foil if you don’t want your top overly browned. 6. Carefully remove the bread from the oven onto a cooling rack. Brush the top with melted butter and finish cooling. They're blue so that's a good sign :-). Funny story! I love that your family ate cold cereal! Sounds like my home when I'm in the middle of something. It sounds like a winner to me. Congrats on your ribbons for a great loaf of bread. Laura, wow!! 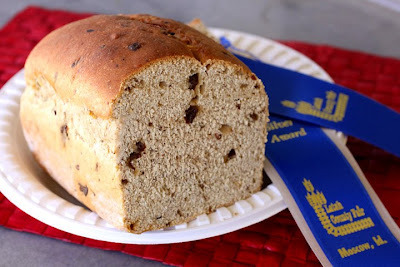 Congratulations, I love raisin bread,and that's what Cami eats for breakfast almost every day. I have to try this recipe for sure. I continually try to enter our State Fair in the baking competition, but so far, I haven't found the courage. I love you story. Congrats on the ribbons. I want to try this recipe soon. Are they really no eggs? Really, no eggs. I hope you like this one!